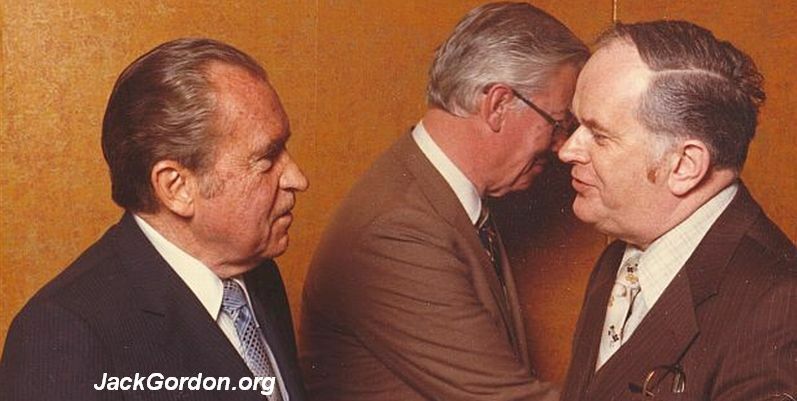 With U.S. President Richard Nixon during a Nixon visit to Seattle in early 1980s. "The Seattle Post-Intelligencer asked Jack Gordon, official civic greeter for Greater Seattle for almost 20 years to "cover" the 1968 campaign visits of major polotical candidates to Seattle." Gordon covered campaign stops by Governor Rockefeller, Sen. McCarthy, Sen. Robert Kennedy, Richard Nixon, VP Humphrey, and Gov. George Wallace.